Our Bacon-Wrapped Filets are a tantalizing taste combination. 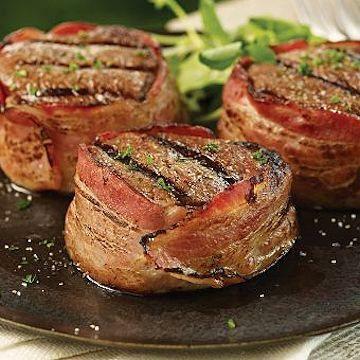 Juicy, tender Filet Mignon wrapped in a savory strip of bacon. Removable metal skewers hold bacon in place during cooking. Gas or Red Hot Charcoal Grill - Preheat the grill on high. Lightly oil and season steaks. Refer to cooking times below. Allow 3-5 minutes resting time before serving. Apply finishing sauce or glaze if desired.